With a commitment to building a more vibrant blog, I signed up for the 4-week Blog Triage class with Cynthia Morris and Alyson Stanfield. Today’s assignment is to describe the people I want to visit and read my blog. This is difficult for me to pinpoint exactly who should read my blog, but I will say my intention is to bring you beauty, inspiration, education and innovation. Beauty: Through my creations whether it is my poetry or art, I hope to allow a space for respite and renewal. Inspiration: Through my #paint52 Series, which takes you on a journey of my challenge to paint 52 paintings in one year, I hope to inspire you to create as well. Innovation: Through alternative ways to create digitally and other mediums of exploration in art, become familiar with ways that can enhance your creations. Education: By bringing to you art tips, history and literature regarding art. my desire is to create dialogs with my friend’s fans and collectors. In this fast moving world of left-brain activities, I hope to open your heart, stimulate your mind and feed your soul. You engage all the senses Janet. I love your writing and your art! Youcertainly give us all of these Janet and yes your writing, poety and art are inspirational and stimulating. Thanks for the comment Shannon, I guess I do want to wake people up and “engage their senses”. Thank you! Thanks Elly, I do enjoy being a muse to others. I know how difficult it can be as an artist to keep on creating. I so glad I can inspire. Thank you for validating my desires and intentions. Thanks for sharing! Oh by the way when I read ” This is difficult for me to pinpoint exactly who should read my blog, but I will say my intentions is to bring you beauty, inspiration, education and innovation. ” Immediately I said to myself .Janet all of your intentions have been received. Thank You ! Bill it’s so great to know that my intentions are well received. Thank you so much! Janet, I do think you have met your intentions. So well stated too. I’m a fan and find it worthwhile to track your blog and learn more. And I need inspiration as I’m at somewhat of a block right now. Partly it’s so many other things going on in my life and also a back log of finished but unsold paintings. Nothing like selling to make you want to paint new ones. I wouldn’t really care from a financial standpoint, but my house is full and I need to get rid of some art work. So I will be following you. I am so glad you are following my blog Mary. I know what you mean, selling art is imperative for motivation, let alone we need to get our work out there so it is seen. Are you currently showing you work? Nice!!!!! like a warm soothing day dream. If you say so Chrissy, I know I have, thanks friend. Hey Steve, thank you so great to see your comment, really appreciate it. 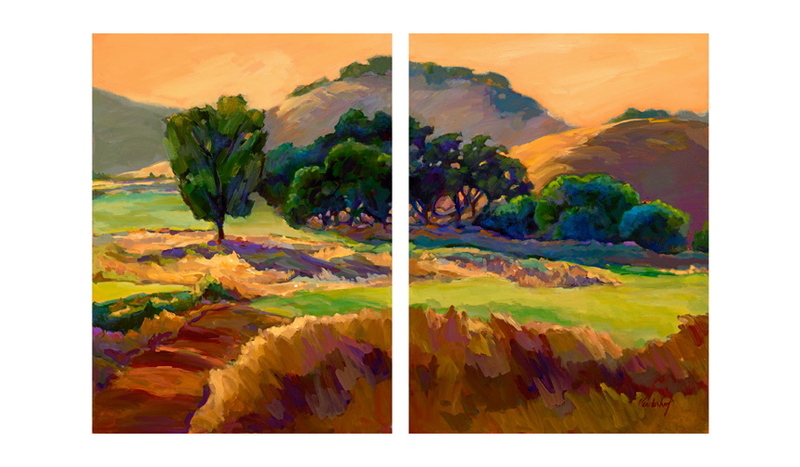 The painting is of Lion’s Gate (Corde Valle), just down the street from you. Love that time of the evening when the hills are silvery. Janet–I think you’re off to a great start (with Blog Triage). Thanks Stephanie, I know I’m going to learn a lot as usual. Alyson’s workshops are the best. Beautifully said Janet! You hit the nail in the head! What a succinct statement. I especially love the open heart and feeding of the soul part. Looking forward to learning more about your journey during our Blog Triage class. Hi Mary, so nice to meet you. Thank you for reviewing my blog. I haven’t had any feedback from Cynthia or Alyson yet, so it is nice to know I’m on track. I liked the way you altered our class assignment to bring your readers inside your heart and to describe your intentions so beautifully. Bravo! I popped over to your 52 paintings and am in love with GLI ALBERI DI UNA BAMBINA – what a fantastic dose of color. I am inspired! I’m looking forward to getting to know you and your art through our class time these next few weeks. Hi Frances, I was a little worried I wasn’t following directions, but in the end it helped me to clarify my intentions. Thank you for visiting. Thanks so much Liza, so great to meet you! What an interesting assignment! And seeing all the comments, I would say your intention has a lot of power and is drawing to you the audience you seek. I am starting a blog too (destined to debut soon), and I think I will contemplate this question for a blog entry. I also love the pieces you posted with this blog. Yes, it’s a great workshop. Alyson B Stanfield has wonderful workshops and gives so much information, but she does make you work. I am so surprised at the amount of the responses to this blog and am very grateful. Thank you Debbie!